I understand that some readers may be sceptical of the title of this post, but bear with me and all will be revealed. This is a subject I have touched upon before but here I will explain it more fully. What is a “trollen wheel”? A bit of background first as no doubt some of you will be reading this and wondering what on earth a “trollen wheel” is. In it’s most basic form, a trollen (or trelleborg) wheel is a disc used for braiding. 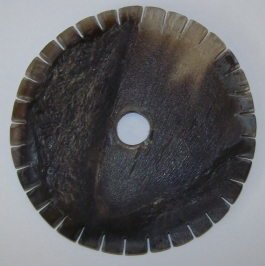 Around the edge of the disc are a number of slots (it varies but it is an even number that generally seems to vary between 24-36) and in the centre is a relatively large hole (maybe 10-12mm). They are usually made of organic materials (bone, horn, leather or wood). The picture below shows one. The key bit of information that is missing from the above paragraph is a find site – that is because none exist. Not one. In the last 100+ years countless Early Medieval sites have been excavated in Western Europe and not a single one of them has turned up anything like one of these notorious discs. Re-enactors will often cite a number of excavations as having produced these. usually Hedeby, Birka, Trelleborg or York but these are all wrong. Not one of these sites has a find that fits the above picture or description. At this point, no doubt some re-enactors (and possibly other people) are reading this and fuming that I am discrediting something they know as “fact”, I will say the same to you as I say to people at shows when I tell them that – get back to me with a real reference in an archaeological report (date of publication, author, title and page number) and I will reconsider. Please do not just say “but my group leader/authenticity officer/bone worker etc say they were found”. However, over the last 10 years of doing this not one person has ever come up with a reference and I doubt they ever will. So what is the evidence for their existence? Simply put, there isn’t any. This is a subject that has been researched numerous times by re-enactors, historians, textile bods and various other people and the conclusions are always the same – there are no Viking age finds of trollen wheels, indeed the earliest is probably 17th century. One of the most telling facts is that in the book “Tools for Textile Production from Birka and Hedeby: excavations in the Black Earth 1990-1995” by Eva Andersson (which lists over 2500 artefacts) no mention whatsoever is made of these having been found. This is especially important as Birka and Hedeby are the two most often quoted sites for these to have been found and the volume is actually discussing textile tools. In addition to lack of finds of the artefacts itself, there are no examples of braids that could only have been made on a braiding wheel (which would provide at least indirect evidence of their existence). This kind of evidence would be unlikely though, as identical braid can be made by the fingerloop method and I am not sure that a style of braid unique to the wheel would even exist. One of more in depth discussions regarding these took place on the Soper Lane forum, and during the course of the discussion it was mentioned that various people from the historical and archaeological community had been contacted (including some one who specifically has researched period braiding) and not one of them knew of the slightest evidence for these discs prior to the 17th century. So why do so many people use them? The simplest answer is ease. They are an item that can be quickly made from a scrap of stiff leather and can produce a braid. At shows, schools etc kids can have a go and make their own, and it can be put away in a basket partly finished (unlike finger braiding). The main reason for their continued use by the re-enactment community (despite many or most authenticity people knowing they are not period) is that it allows someone to get on and do something creative rather than twiddle their thumbs in the village. I also suspect a further, unspoken, reason is that if they were suddenly banned across the board by various societies there would be an uproar (after all, many re-enactors do truly believe them to be authentic) and it would also be very difficult to enforce, the best we can ever hope for is that the people using them understand that they are an allowed anachronism and explain that the public (and newbies) rather than trotting out the same old rubbish about finds from Birka and Hedeby. What about the Caddys man of Tudor times? I can’t say I have ever come across a “Caddys Man”, could you supply any further information, an image or link perhaps? ‘Caddis’ is a type of woven ribbon or ‘braid’ (contentious term) imported into England via Cadiz in the late 16th century. Thanks ever so much for your clear and detailed debunking of the stupid trollen wheel. I am writing a paper on ‘internet myths’ for the Early textiles Study Group conference and will refer to your site. I am sharing on facebook. Ruth Gilbert, textile historian and evidence-based interpreter. The Caddis Man of old was a pedlar. He used to travel around selling his wares to the towns he travelled to. Shakespeare mentions the caddis in at least two of his plays. Henry IV and The WInter’s Tale. Usually referring not only to the worsted tapes and garters he sold, but the other braided work and ribbons he would sell too. I make a simple little wooden braiding discs like your dear ‘trollen wheels’ to make braids. Inkle looms for making the wider tapes is something I want to have a go at too. Have you looked at http://www.braidsociety.org ? Not cheifly historical, but when they are, totally reliable. And all you need for flat woven tapes is a heddle. Honestly, I make bag straps that way – hook in the wall, tie to your belt. Heddles are interesting because they are known in this country during the Roman period (https://halldorviking.wordpress.com/gallery/boneworking/#jp-carousel-176) and they seem quite popular with the Romans, and then there are examples from Bergen in the 13th century. However during the Early Medieval in Britain there is currently no definite archaeological evidence for them. It seems that as such a simple tool they must have survived rather than being forgotten for a few hundred years, we just haven’t found the evidence yet. Thank you for this resumee – I’ve bought my Trelleborg wheel from British reenactors with good will (it was preinternet time) and I was really surprised that it looks like kumihimo disc. I like it anyway, but it is good to know that there are no artifacts found in Europe.